Dry Fire Practice continues to grow among all levels of shooters as a way to increase skills without the high cost of live ammunition. Recently our own Matthew Maruster published a fantastic article about the Various Uses of Dummy Ammunition and Snapcaps and in the light of his excellent thoughts, I want to take a look at the 3 biggest players in dummy ammunition. First, some quick vocabulary to clarify the difference between Snap Caps and Dummy Ammo. Snap Caps are the name of a specific product made by A-Zoom. As the dominant player in the Dummy Ammunition category for a long time, for many folks, Snap Caps have become the term to use when referring to any dummy ammunition much like Kleenex is to Facial Tissue and Band-Aids are to Adhesive bandages. Given that this article is comparing Snap Caps (the product) to competing products, I will be referring to all these products as dummy ammunition and when I say Snap Caps I'm referring to the product made by A-Zoom. I've chosen what I believe to be the 3 highest quality and most popular options in the marketplace. Frankly, there is NOT a ton of competition but from what is available these 3 companies are the top 3 in my opinion. All three companies are US based and all their dummy ammunition is manufactured in the US. A-Zoom brand Snap Caps are now owned by Lyman which is a larger company. Newbold is an upcoming company making their name with really clever polymer molded targets, and ST Action Pro is primarily focused on their dummy ammunition products. *Disclaimer: We do sell A-Zoom and Newbold products on our own site. Links in this article will take you to those product pages. We do not currently resell ST Action Pro rounds. Despite this financial incentive, I've prepared the below thoughts and review as much as possible without bias. The industry has an ongoing debate about the possibility of damaging your firearm by dry firing the gun. The key issue is that the firing pin COULD be damaged over time by NOT striking anything. Hitting nothing but air can arguably damage the firing pin over time. It is ok to dry fire your Glock pistol, but in situations where the pistol will be subjected to continuous sessions of dry firing, the use of a snap cap or dummy round is recommended. The theory is that by using dummy rounds you provide something from the firing pin to strike. This is however, probably the single biggest point of differentiation between these three products. This is for me where ST Action Pro dummy rounds fall short. Of these three, ST Action Pro is the only product that has no primer cup. This means that if you have any concerns about causing damage to the firearm when dry firing you will want to consider either A-Zoom or Newbold rounds. The A-Zoom Snap Caps are primarily all one metal piece but the primer cup is actually an inserted hard plastic piece. On the Newbold rounds, the shell casing has a single solid polymer piece that sits in the shell casing and sits flush with the bottom of the round. So in the category of preventing firearm damage, I would say ST Action Pro loses and Snap Caps and Newbold rounds are a close tie. I've run all three dummy rounds through my magazines and guns several hundred times in preparation for this article and countless times in the past. The Newbold rounds are newer on the market so I have less overall experience with them but in the last 12 months have used them exclusively without a failure. I think you can't go wrong using any of these products as it relates to them doing what they are advertised to do. The A-Zoom Snap Caps are a solid machined aluminum metal piece with the primer cup insert. Despite my best efforts, I cannot remove the primer cup insert. Now while it is nice that the entire thing is a single piece of metal the primary issue many people have reported is that the aluminum is too weak. With about 10 cycles of a Snap Cap I can already see flakes of the aluminum that have come off where the extractor engages the round. My friend Riley, and many others online have reported that with ongoing use of Snap Caps, entire shards or rings of aluminum can also come off and be left in the barrel or gun. In contrast, the ST Action Pro and the Newbold rounds are not single pieces of metal but they are made using actual steel/brass casings. 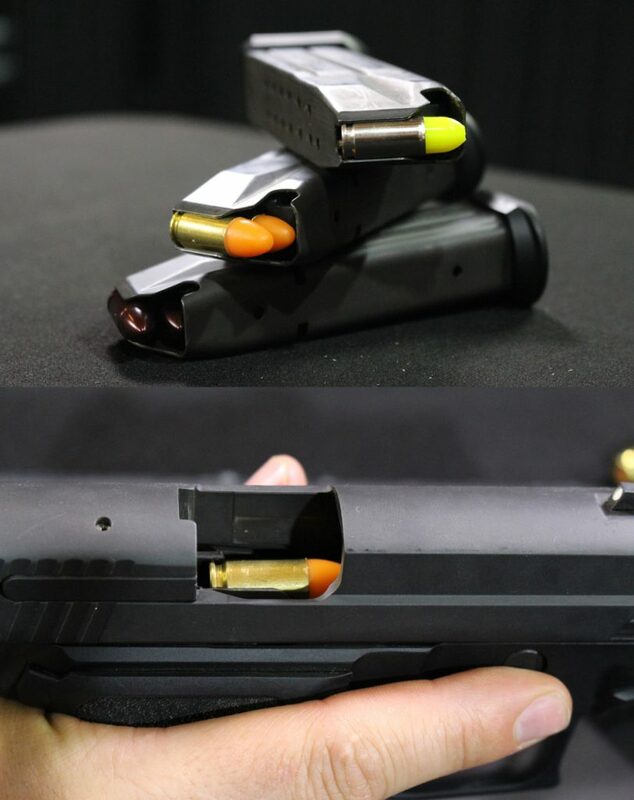 I would call that an advantage as it will stand up to any use since those casings are designed for live fire. Using some tools I was able to forcibly remove the polymer from the casings of both Newbold and ST Action Pro rounds but that was more of a way to prove to myself it is possible when honestly I don't see how regular and normal use could ever cause any problems. In this category, despite first impressions, I would say the Newbold and ST Action Pro rounds win. One thing going for ST Action Pro is that you can buy dummy rounds in single quantities. Only want 1? That is an option. Newbold and A-Zoom rounds are only sold in packs as small as 5. In addition to being available in any quantity, ST Action Pro is just generally the least expensive of these three brands. A-Zoom Snap Caps are the most expensive … by about triple but they set themselves apart as being a solid metal piece that they claim will last forever. If you don't care about price and think these will last a long time you should probably buy Snap Caps. But experience has shown they do wear out and have to be replaced. If you care about having something in the primer cup to prevent potential damage to your firearm, but ultimately think that the polymer option is best then you should probably buy Newbold rounds. A look at a pack of 5 dummy rounds in 9mm Luger from each company. These are MSRP prices before shipping. ST Action Pro rounds are available in Orange in all calibers and optionally Yellow in a few calibers (though I've primarily used yellow for the pictures in this article). Newbold is currently expanding its product offering into other calibers and intends to use different colors for different calibers. 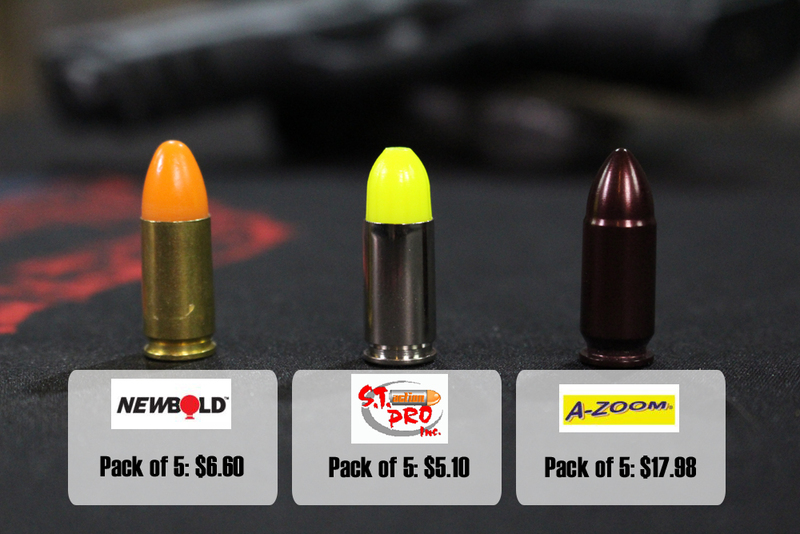 This would help you more easily distinguish between dummy rounds of different calibers. A-Zoom rounds are what you see. No color options and they are all the same regardless of caliber. Since I use Dummy Rounds for various malfunction drills at the range I end up looking in the dirt for my expended dummy ammo. They are too expensive to leave in the dirt and I get a little grumpy when I can't find one. In my opinion, all of the dummy rounds reviewed in this article are equally easy to find in the dirt, though if one is just slightly harder to pick out of the dirt it would be the A-Zoom Snap Caps. A-Zoom Snap Caps: Solid primer cup to ensure no damage to the gun and it won't break or come apart since it's a single piece of metal. BUT being made out of aluminum means it easily leaves shavings or bigger pieces of aluminum behind in your gun. Also it is the most expensive product by far. 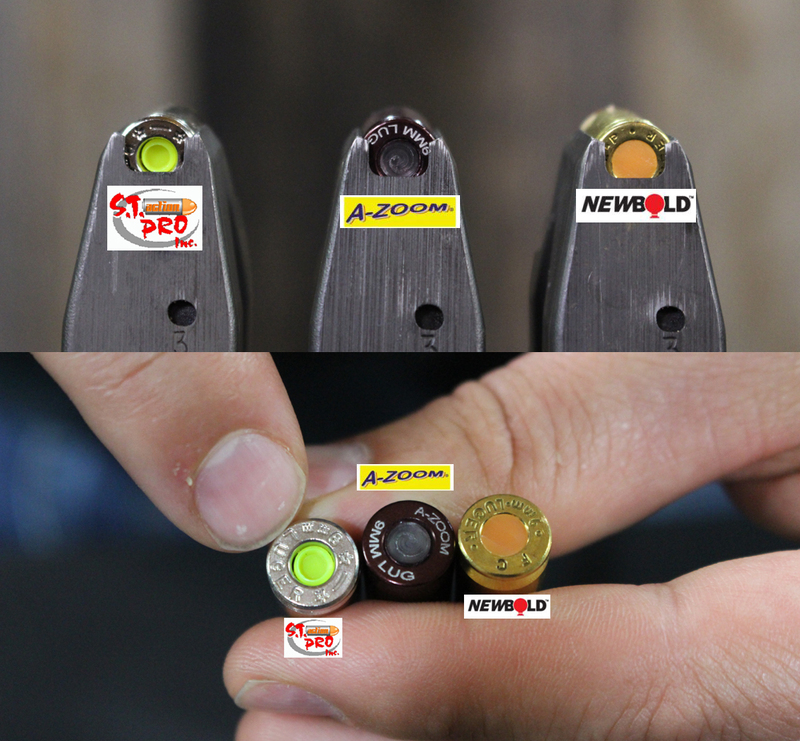 Newbold Rounds: Not the cheapest, but not significantly more expensive than the cheapest option. It has a full primer cup which helps ensure no damage to the gun is possible. I would say between these three it is the only one that for sure will not damage the gun in any way. ST Action Pro: The least expensive but also the only one with an empty primer cup. Well made but could leave your firing pin subject to damage over time. What do you prefer to use for dummy ammunition? Have a question I didn't address? Let me know below in the comments. The firing pin is not the only part that may/may not be damaged. You would also want to determine damage to the feed ramp and chamber, but mainly the feed ramp. Because with repeated uses the cartridge cases can curl and in the case of the all metal one, that metal has to be soft, or at least as soft as copper, to not wear on the ramp with high use. I’m not sure how strict sizing is with non-firing rounds but with real cartridges it is a major concern. Especially, with repeated chamberings. They seem like a very solid and functional tool although I’ve yet to use any myself. They are on the more expensive side. Another concern for me is how similar to an actual live round they look. The A-zoom case is a very different color. I can perform a press check with them and know that this is a snap cap and not a live round. The other two have a brass and silver case which looks very much like a live round. I realize that when dry firing, you MUST not have any live ammunition in the room with you. You MUST check and double check that the handgun is not loaded. However, I like the extra precaution that the case of my snap caps looks significantly different from live ammunition. My two cents. Worth about half what you paid for it.